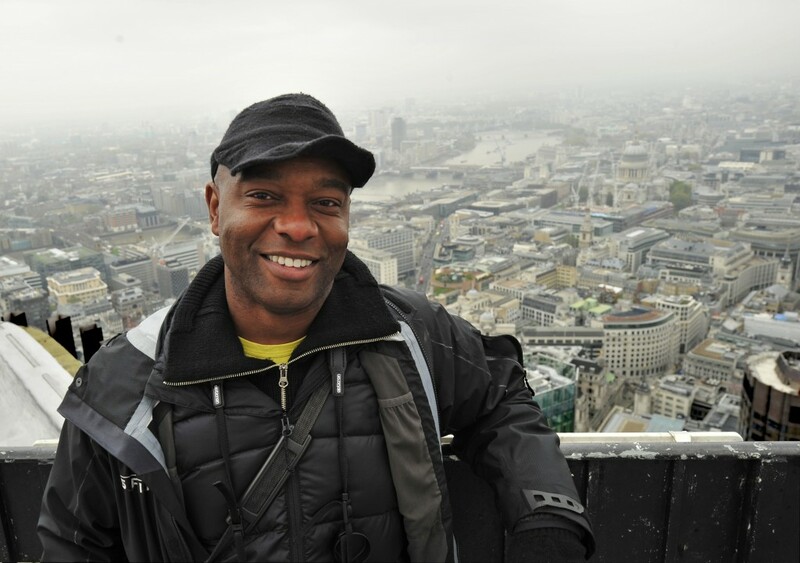 I’m David Lindo, also known as The Urban Birder. I’m a broadcaster, writer, tour leader, speaker and educationalist focused on getting us urbanites excited about the wildlife in our cities. Growing up in London, I have been fanatical about birds since before I could walk and learnt long ago that you don’t have to go anywhere exotic to have amazing wildlife experiences. All you need to do is walk out of your house or office, wherever you are in the capital and just look up. Nature surrounds us, even in the middle of the concrete jungle. When people ask what my favourite places are to watch birds in London are they are often surprised by my response. Instead of naming a well-known reservoir, an oft-mentioned park or a famous nature reserve well away from the city sprawl I cite my favoured birding sites as firstly Wormwood Scrubs in West London followed very closely by Tower 42. How did I stumble onto the roof of Tower 42, you may ask. Well, I’m very interested in migration and believe it or not, London is a great place to witness it. For a long time I wanted to get on top of a tall building in the capital to observe migrating birds of prey during the spring and autumn. I originally contacted the management at Tower 42 in the autumn of 2009 in the vain hope that they would allow me to stand on the roof to watch the skies. To their eternal credit not only did they allow me to do that but to also form the Tower 42 Bird Study Group. Weather permitting, the group meets once a week during the spring and autumn for a total of roughly nine four hour sessions to record what flies over. For the most part we see very little and end up instead spending our time marveling at the glorious cityscape. Even on those quiet days we normally see plenty of Herring Gulls and Lesser Black-backed Gulls wheeling around the skies of London. We also regularly see Peregrines. These mighty predators are a conservation success story. From verging on extinction in Britain during the Second World War they are now much more numerous. In London alone we now have over 20 nesting pairs – six of those territories are visible from the top of Tower 42. Over the years, aside from regular Sparrow Hawk, Buzzard and occasional Kestrel sightings, we have recorded some incredible central London scarcities. Birds like Red Kite, Hobby, Hen Harrier and Marsh Harrier have all drifted over the building. The rarest bird of prey we discovered were the two separate Honey Buzzards that flew over within a couple hours of each other during spring 2011. There are less than 20 breeding pairs of this majestic raptor in Britain, so we were truly blessed. We have also seen other species like Swallow, House Martin, Swift and even seafaring Kittiwakes, Arctic Tern and shorebirds like Oystercatcher. 2014 was a little quiet in comparison to previous years and it was largely due to weather conditions. During the spring we pray for warm days with a light southeasterly wind that could potentially be carrying movements of raptors fresh in from their wintering grounds in Africa. During the autumn we lust after calm days with a light north easterlies and the hope that migrating raptors from Scandinavia will be riding on them. It is a lottery and more often than not the days that we chose to man the roof result in the wrong winds blowing and no birds. Even if the conditions are right it doesn’t mean that the skies would be alive with birds. Often we just stare longingly into empty skies. But despite the unpredictability, I love being on the roof of Tower 42, as do my colleagues. There is an unbelievable feeling of peace up there. I for one could spend days up there just staring over our beautiful city. With winter approaching I begin to dream again of spring days standing atop my favourite building in London. Maybe I will see something amazing drift over. I can barely wait!